The Parañaque Integrated Terminal Exchange started operating Saturday. It is a joint effort of Megawide unit MWM Terminals Inc. and the national government, through the Department of Transportation, to put a semblance of order to the chaotic transport system that has plagued commuters for years. The PITX is supposed to be built like an airport, designed to facilitate commuting routes to those traveling between Metro Manila and southern destinations. Operations are governed by a department order, which identifies routes and transport lines. The Land Transportation Franchising and Regulatory Board is expected to come up with a memorandum that would further provide details. Vehicle schedules are also published to guide the public, even as these routes still need to be firmed up. Public transportation in the Philippines is deplorable compared with those of other countries. Passengers expend precious time and energy going to and from destinations instead of channeling these to their jobs or studies. They become vulnerable to external, often-unpredictable factors that start a chain of inconveniences on any given day. 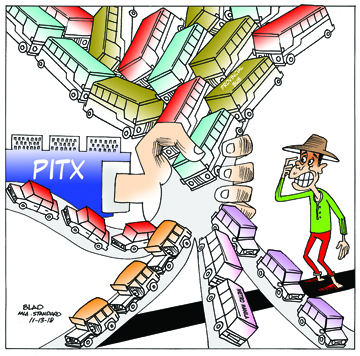 The PITX, if operated as intended, will remove, or at least lessen, these commuting factors and will make the public’s daily living struggle just a bit more bearable. New systems often elicit resistance, and the new routines occasioned by the PITX will no doubt create confusion and discomfort. We hope these are temporary, and that those tasked to put order into chaos will not create new disruptions and failures of their own. The riding public deserves no less.